The magnificent Neo-Gothic building of Victoria Terminus (now Chhatrapati Shivaji Terminus), is an apt starting point for exploring the more enduring facets of erstwhile Bombay. 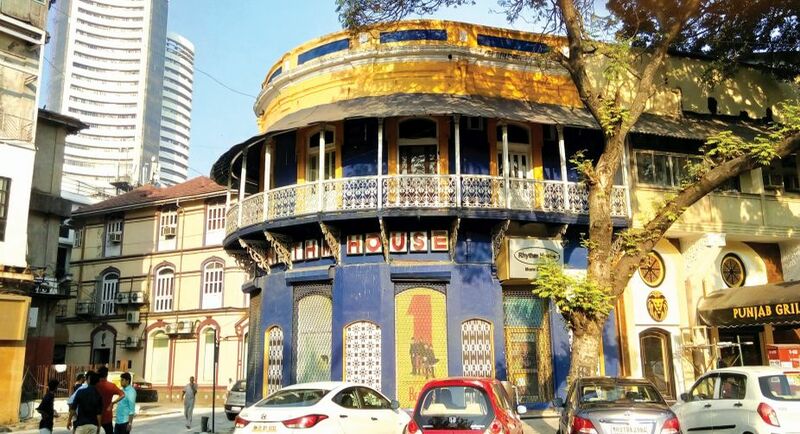 During peak hours, millions of commuters rush to and from nearby commercial areas like Fort, Flora Fountain, Horniman Circle, Kala Ghoda or Nariman Point, but the charm of this heritage area remains undiminished. You must walk this stretch all the way up to Gateway of India. Take your time to marvel at the buildings like the Old Mumbai University, High Court with its clock tower, the Prince of Wales Museum (Chattrapati Shivaji Museum), Elphinstone College, Sassoon Library, Parsi Fire Temple, Horniman Building and that of the Asiatic Society — just to name a few. This is the colonial south-eastern part of Mumbai and architecturally, its most beautiful. 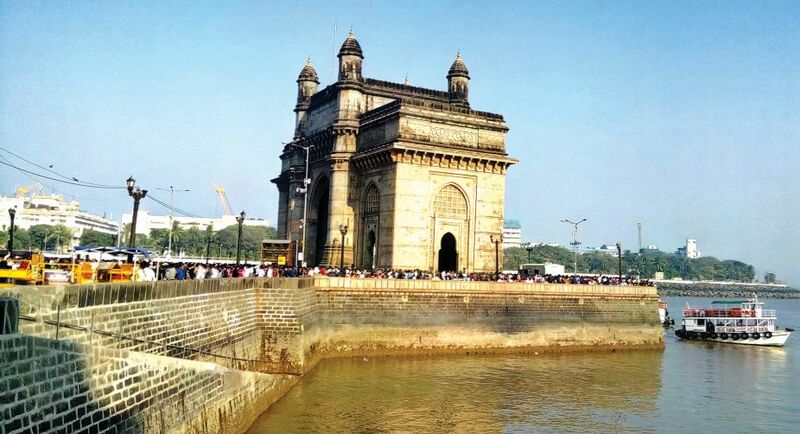 At the end of this stretch is the Gateway of India and Taj Mahal Hotel — the former a commemorative gate to mark the arrival of a colonial king and the latter, the proud expression of an Indian businessman. From the adjacent jetty, ferries leave for Elephanta Island, where an amazing group of Buddhist and Hindu rock cut cave temples lie in a wooded hillock. Many of Mumbai’s pleasures could be enjoyed free of cost or at a very nominal cost. One can get a fantastic view of the bay area and Marine Drive from the Kamala Nehru Park in Malabar Hills, still popularly known as the Hanging Garden. At night, the bright streetlights that line the semi-circular bayside road sparkle like a necklace, which long ago earned this gently curving stretch of the coastline, the nickname of “Queen’s Necklace”. It’s the loveliest view in Mumbai. 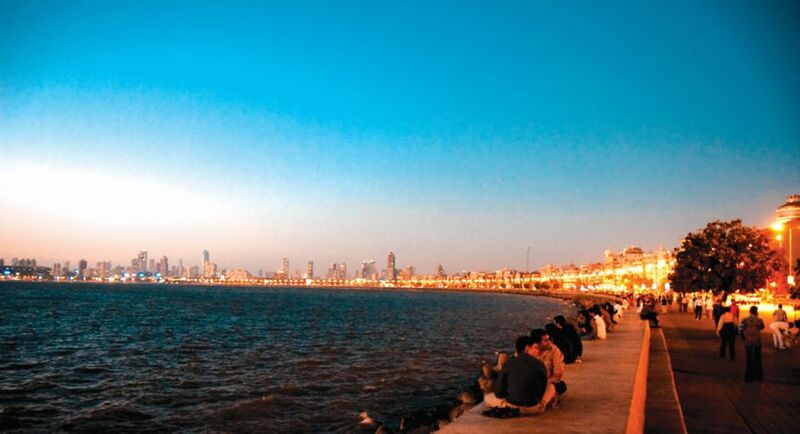 The Marine Drive promenade itself is ideal for watching the bay and sky-scrapper studded Malabar Hills, as well as art deco residences on one side of the road. A long walk or a short ride will take you to the Aquarium where, on a warm afternoon, cool moments can be spent with creatures from the sea. A little away is Gurgaum urban village, a tiny Maharashtrian Heritage Enclave where original residences, some of them with exquisite wooden balconies, still stands. The area gives impression of an urban oasis amid a concrete jungle. To know more about Maharashtrian heritage and culture, one is recommended to visit the Bhau Laad Museum, located in a beautiful building with an equally impressive interior. Adjacent to Byculla Zoo, the museum quite imaginatively preserves and presents the cultural and community history of Mumbai and Maharashtra. Talking about low cost of exploring Mumbai, nothing beats a ride in bus no 123 from Tardeo to RC Church, a predominantly Parsi residential area of Colaba. During this ride you get a virtual city tour covering the entire stretch of Marine Drive, Nariman Point, Oval Maidan and then past Fort and Flora fountain covering all those Neo-Gothic public and office buildings as well as Art deco residences and cinema halls, and the iconic tower of the Mumbai Stock Exchange building. The sandy beach of Girgaum Chaupatty is a gathering place of sorts for locals and visitors. Out-of-town tourists still visit Juhu Beach, made famous by old movies. But many locals find this beach way to crowded and dirty. For better environs visit more idyllic beaches at Manori, Gorai or Marve further north, set amidst coconut groves. 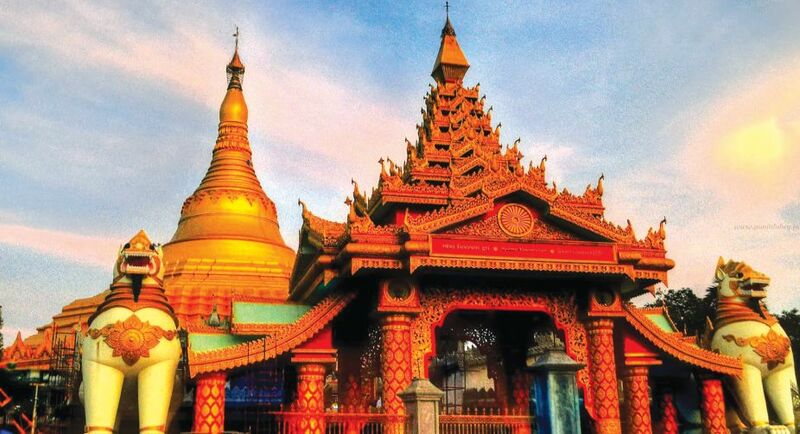 There the huge golden World Vipasan Pagoda is the current magnetic attraction. While a major film production centre, Bollywood does not offer a great studio tourism experience like in Hollywood or Hyderabad. And, unlike in earlier days, top film stars are not easily visible here. 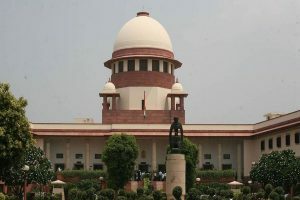 However, many starry-eyed young visitors from around the country consider some buildings in the Bandra -Juhu stretch like Mannat, Jalsa and Galaxy Apartments as minor shrines. Outside these places, every day one would notice sizable gatherings of fans to get an elusive glimpse of their idols. Locals, however, are more excited about the nearby Bandra-Worli Sea Link. 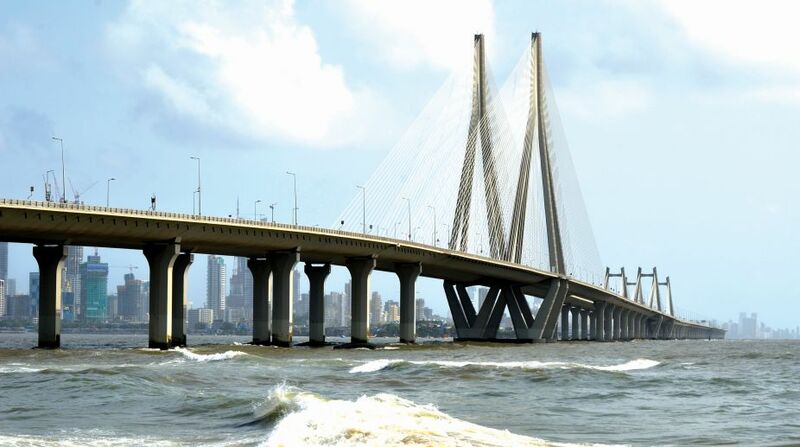 The current pride of every Mumbaikar, this bridge over the bay area connects Bandra and BKC business areas with the up-market Worli residential area near its race course and Nehru Science Center and Planetarium. In Worli sea face area lies one of the most picturesque and popular landmarks of Mumbai — the Haji Ali Mosque. The shrine is located a few hundred meters inside the sea and accessed through a walking path that gets flooded during high tides. Watching a sunset with the silhouette of Haji Ali definitely gets etched in viewers’ mind for a long time. Nearby the Mahalakhsmi Temple is equally popular. But the ultimate religious destination for everyone in the city is the Siddhivinayak Temple for its wish fulfilling Lord Ganesha at Prabhadevi. The temple is always crowded and on specific auspicious days, long queues to get a coveted darshan could be seen even deep into the night. Despite the perennial problems of increasing population and encroachment, the sprawling forest of Sanjay Gandhi National Park, at the northern end of this metropolis, has been able to retain its basic character. Apart from diverse flora and fauna, including a mini-safari-park, one should never miss a visit to the Kanheri Caves; an unfinished rock-cut Buddhist monastery deep inside the cool environs of the jungle. This is an area for rest and contemplation, far from the bustle of this Maximum City.